Today I have a great monthly subscription box to share with your courtesy of Fancy! Now, I am pretty used to the beauty type of subscription boxes where each month a company sends a bunch of beauty deluxe samples to my door. This is pretty much the same but it's not limited to beauty items! I was really interested in trying out a Fancy Box subscription because I already have so much cosmetics and polishes piling up in my room but I miss the feeling of coming home to presents in my mailbox. This was a great change and I have to say I was pretty happy with what I received, colour me happy :). 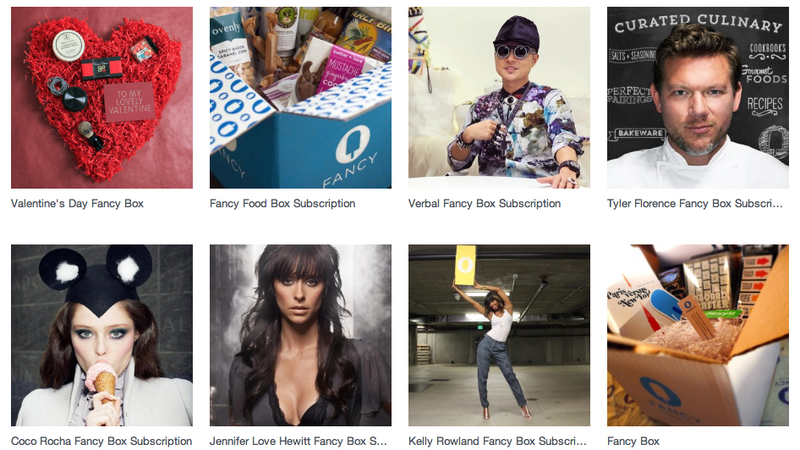 Fancy box is a monthly subscription box priced at $39USD + s/h (they ship WORLDWIDE). Shipping to Canada is $17, while to the USA was shown as $7.95. If you would like to know the shipping rates for your country, simply sign in and make a mock order, the prices will be shown at the checkout. This service is shipped via FedEx. ps. from my "amazing" sleuthing I also found out they will soon be having a Fancy box curated by Isaac Mizrahi (fashion designer)!! At this time, they also have their Limited Edition Valentine's box (top left corner; $80 USD) which you can buy for someone, the items are already known, if you want to know more about this particular box, click here. There is one geared towards women and one towards men. Fancy Box is supposed to include over $80USD worth of items, depending which type of box you choose, they are either food, living and home, technology, or just fun stuff etc. handpicked by a celebrity or the Fancy team. Originally I wanted to try out Coco's or Tyler's but I got the Kelly, it ended up being a box I liked so yay! My reasoning was because Coco would be more beauty/fashion oriented so it won't be TOO much out of my comfort zone and Tyler because I was excited for all the fun kitchen tools to play with! Okay, enough rambling... let's look at the goods. First thing I saw was a cute envelope with my billing papers inside, it also included a cute sticker and a thank you card. Of course, I put that aside and started emptying the box! Each items comes with its own product card. On the front, there is a picture of the product with its description and a link to the Fancy store where you can purchase the item. ps. Fancy also made purchasing SUPER convenient, so easy that you can purchase something right now, right here. I'll put more info on that below. On the back, there's a little blurb by Kelly on why the item was included in the box. Ok so exactly what did I receive? Purples are difficult to photograph, above is the actual colour of the beanie. First thing: yay purple. But I don't really do beanies, I got a big freaking head and nothing stays on, glad I got this colour though, it's subtle. The quality is there, and would definitely keep my head warm, if only. My friend tried it on and it looked good on him though, so I am sure it can be easily passed on. Since I didn't have a previous subscription, I missed out on the camera. I think Annie has one though. Do you Annie? hehe. I really like film photography and I think the idea of lomos are cute. I miss film so much, being in the darkroom and developing your own pictures etc!!! But I digress..if you had the camera, I think this would be a pleasing addition to the box. These are SO cute, the colour is called Sunset Gradient. It goes from yellow at the earbuds to red at the jack. LOVE it. I can never have too many headphones, I think I am using 3 pairs right now. You can view the headphone before opening the actual box, which is good when you're shopping for headphones! Anyway, being a cheapo, I was a bit taken by the price but I've seen other headphones almost be up to $100, wowza. Such a cute idea, I don't know if you know but I adore sticky notes, notepads etc. This one pretty much takes the cake though. It's fun and really solves the problem I've had about sticky notes all this time: SIZE. With this, the whole back is adhesive so I can write as little or as much as I want and rip it according to size. There are two cons to this though, I though I would just "paint" it against the wall and somehow just rip it off, but you need to do this by hand, so while it's in a roller you still pretty much need to rip and stick. The 2nd con is it's only offered at the moment in PINK. bwahaha, okay fine it's not really a con, just joking with you! 5. Coca-Cola Coke Can Glasses. $18USD for a set of 4. I am definitely a Coca-Cola girl. I adore Coke glasses. I remember when McDonalds was having a promotion of the curvy ones in the USA, I drove down to buffalo and picked up a set haha.. I think the shape is delightful, and coming in a pack of 4 takes the cake. My family loves these and I am glad there is enough to share. Although Kelly says these glasses can be used for water, I think I'll pour myself a Coca-Cola first. Look how great the packaging is, I could be throwing this item around and it wouldn't break! The bubble wrap was so thick! The total value of this box came to $105USD calculated from Fancy values. Despite the shipping cost being a little steep (but understandable, after seeing the items), the value was great and I had such excitement to open the box. Overall I liked the selection in the box. Some items weren't right for me but I could definitely pass them on. The items that I did like, are pretty much staples already - headphones in my purse, sticky notes all over my wall and glasses sitting on my counter - washed and ready to be used! Do you already subscribe to Fancy Box? What are your thoughts? *So I just wanted to pass on some info about Fancy Box's purchasing widget. With this widget, you can click on the item you loved from this post and directly purchase it here safely. All you have to do is click on the green button on the product picture =). The products in this post was given to me in exchange of a review. All opinions were my own and was not affected in any way by Fancy.